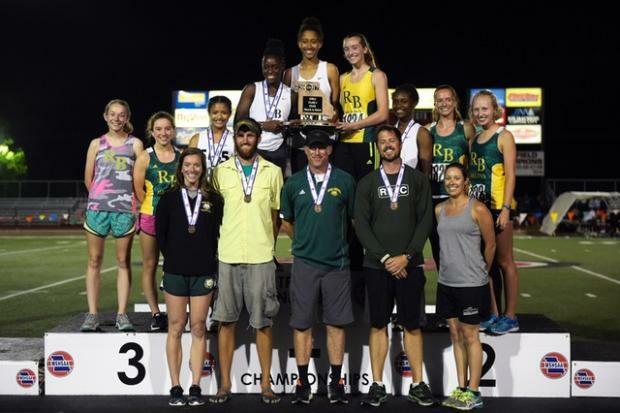 Rock Bridge has been one of the best and biggest programs in the state for year. Most of the success of the program was based on a historically strong distance program. However, this year's squads was a balanced team with a great output in distance as per tradition but additionally in the world of sprints. Coach Blackburn is a man after my own heart. There are two people you can hear at state all meet long me and Blackburn. The man is intense, passionate, and loves his track & field. The man never sits down and is constantly coaching. Congrats coach! Coach Blackburn: Obviously, we were very excited to win a trophy. 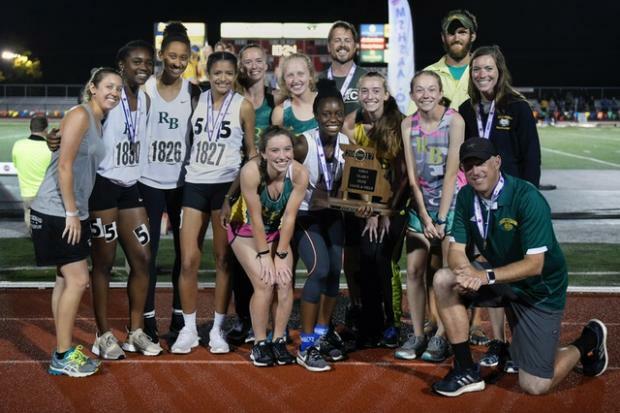 We have had such a great group of kids all season long and to see them put things together in a way to compete for a trophy in the waning moments at the state meet was quite dramatic. We thought somewhere between 25-40 points at the state meet could potentially cut it. We felt like LSW and HC would tabulate so many points that 3rd-8th would be pretty close. We had several key moments. Jordan Banker's 3rd attempt separating her from the log jam of vaulters at 10'9", and probably the 4X1 capturing 2nd place made a trophy attempt reasonable. Once again it's hard to look at one person or one moment, but Ojurere Shonekan capturing 3rd in the Long Jump, 2nd in the 4X1, and 3rd in the 4X4 was a fantastic way to finish off her career, along with our first year athletes, Elle Brown who was on both relays and ran sub 57 in the open 400 and Mya Drayton, a freshman, who split 58.5 in prelims and ran on both top 3 medals. We broke our school records in the 4X1 and open 400 and it was our first track team trophy in school history. We've traditionally been fairly competitive at the middle and long distances, so to see our sprinters perform as well as they did was incredibly exciting. Our sprint relay finishes and open 400 were school-bests as well as having a female runner-up in the pole vault. Our athletes handled things about as well as I could've scripted. We knew when the delay for several hours was announced, our job was to get them out of the competitive environment so they could be themselves for awhile, so we spent the majority of that time at a restaurant eating, hydrating, laughing, and enjoying the company of one another like we do so often after meets since we typically travel for 2 hours every weekend. Once we got back from our late lunch and had to get off the bus to compete it became business as usual with little lapse at all in our competitive focus. I think they are trying every year to make the event better than it has been in the past. Like others, I would love to see a warm-up spot closer to the bullpen in some capacity. Class 5 got the short end of the stick with the wait-time in the bullpen which on warmer days will dramatically impact performances. When we've competed out of state we have had announcers that have educated the crowd on what these performances meant, state-wise, historically, top 50 in the country etc...A more informed crowd becomes a more appreciative and engaged crowd which stimulates the athletes that much more. I would love to see the 3200 run at night under the lights to have the kinds of performances we saw, most notably in the class 4 boys' race.